Search Through Files Compressed with WinZIP, 7-zip, WinRAR, GZip, BZip2, etc. With PowerGREP, you can quickly search for a piece of information through files and folders on your computer and network, including files compressed inside .zip files. This is particularly useful when extracting information from archived documents, or when gathering statistics from compressed log files. With PowerGREP you can work with zip files and other archives as if they were regular file folders. Files inside archives are decompressed on-the-fly. Now you can save hard disk space or place more files on a CD or DVD by compressing them, and still search through them as usual. When collecting data or converting many files, PowerGREP can save the results into one or more new zip archives, even if the original files were not compressed. This is particularly useful if you plan to email the results. Now you need to attach only one zip file. If you like to keep backup files around, save disk space by telling PowerGREP to compress backups into zip archives. Use the "numbered archive" backup type to create a new archive for each action's backup files. While PowerGREP's Undo History handles zipped or regular backup files just the same, a single zip file is handier if you want to archive backups outside of PowerGREP. Of course, sometimes you don't want to search through .zip files. You can tell PowerGREP to treat .zip files as ordinary files or to skip them entirely. Or maybe you want to search through archives in a particular format, but not through any other archives. The "archive formats to search inside" setting on the File Selector lets you tell PowerGREP exactly which files should be recognized as which archive formats, and whether to search through them or skip them. All of PowerGREP's features are available for these file formats. PowerGREP can modify files inside these archives and add files to them and delete files from them. It can also create new archives using these formats. ZIP archives: ZIP format used by PKZip, WinZIP, and a host of other compression utilities. This is the most popular archive format. ZIPX archives: ZIPX format used WinZIP. Incompatible with most ZIP tools, but allows better compression. 7-zip archives: 7z format used by 7-zip. This format yields the smallest files of all the archive formats that PowerGREP can create. TAR uncompressed: Uncompressed tarball (.tar file). The most popular archive format on Linux, usually compressed using one of the four methods below. TAR GZip: Tarball compressed into a GZip file (.tar.gz or .tgz file). TAR BZip2: Tarball compressed into a BZip2 file (.tar.bz2 or .tbz file). TAR LZMA: Tarball compressed into an LZMA file (.tar.lzma or .tlzma file). TAR XZ: Tarball compressed into an XZ file (.tar.xz or .txz file). CPIO uncompressed: Uncompressed CPIO archive (.cpio file). CPIO GZip: CPIO archive compressed into a GZip file (.cpio.gz or .cpgz file). CPIO BZip2: CPIO archive compressed into a BZip2 file (.cpio.bz2 or .cpbz file). 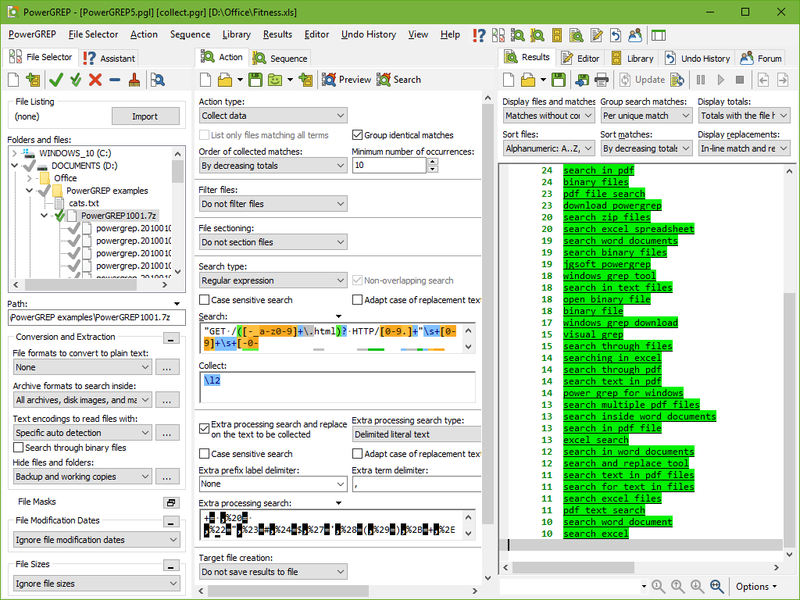 CPIO LZMA: CPIO archive compressed into an LZMA file (.cpio.lzma or .cplzma file). CPIO XZ: CPIO archive compressed into an XZ file (.cpio.xz or .cpxz file). GZip: Single file compressed with GZip (.gz file). BZip2: Single file compressed with BZip2 (.bz2 file). LZMA: Single file compressed with LZMA (.lzma file). XZ: Single file compressed with XZ (.xz file). PowerGREP can search through files stored in these archive formats, but it cannot save modified files back into the archive. PowerGREP does provide extensive options for saving the modified files elsewhere, compressed using one of the above formats, or not. "I can’t tell you how often this program comes in as a lifesaver when researching data issues for me… just today I needed to sift thru 150 zipped files with roughly 10,000 files inside, and PowerGrep not only handled it, but faster than any of us imagined possible." "I just want to tell you that you have a great program there. It turned a job that could have taken hours into a few minutes. The Microsoft OneCare back up system creates ZIP files, hundreds of them. We use an external hard drive and OneCare backs up the files over our network. My daughter is a college student and her computer died. She needed all her notes for one of the topics for a final exam and by using PowerGREP we were able to search the backup drive and get her files immediately to load on another computer for her to continue her intensive studies.